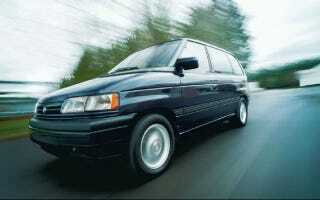 The original Mazda MPV never did a particularly good job of being a minivan. Mazda introduced it when all the car companies felt like they needed a minivan, but hadn't yet perfected the concept of copying Chrysler's minivans while adding reliability. Which kind of makes the MPV the world's first 3-row crossover. As a kid growing up in the late 80s and early 90s, I was at the forefront of a revolution in family transportation. When I was born in 1982, the typical family hauler looked very much like this 1982 Ford Country Squire wagon. But within a few short years, two vehicles would revolutionize the family hauler market. First up, in 1984, were Chrysler's new minivan twins: the Dodge Caravan and Plymouth Voyager. Like I said: a transportation revolution. The other huge leap forward in 80s family transportation was the Ford Taurus wagon, which came out in 1986. It was still a wagon, but it replaced the baroque, wood-paneled styling, gigantic proportions, terrible gas mileage, and rwd body-on-frame platforms of dinosaurs like the Country Squire, with a modern, unibody fwd platform with much more reasonable dimensions and fuel economy. I mean, just look at the difference. It's so...round. Ford kept selling the Country Squire all the way until 1991. Imagine walking into your Ford dealer in 1989 and and seeing the Taurus and Country Squire next to each other. That's exactly what my parents did, and they bought the Taurus: a gray 1989 Taurus LX, fully loaded with gray imitation leather seats, not-even-close-to-realistic wood trim, and the all-important (to my mom) sunroof. So, in the late 80s, when the most popular family haulers were Chrysler minivans, and the Taurus (and Mercury Sable) wagon, several people at Mazda got together and decided, "Hey, what America really wants is a minivan that's smaller than Chrysler's but still has 3 rows of seats, with part-time shift-on-the-fly 4wd, and one rear door that swings out like a car." Mazda's advertising even played up the supposed off-road-iness of the MPV. Look at that majestic mountain range. Well, maybe this isn't a press shot. I don't know. But that's a glorious 4WD decal. Shortly after my mom got her Taurus wagon, my neighbors across the street got a 1st-gen MPV. Their dad was my little league basketball coach. Whenever he caught carpool duty, he'd drive us around in the MPV, with a mug of coffee in the cup holder that flipped down from the side of the passenger seat. Not a travel mug, mind you. A regular ceramic coffee mug. It never spilled. In 1989, cup holders were still a pretty rare car feature, and 7 year-old me was very impressed with how they were mounted to the side of the seat. The MPV sold well its first couple of years on the market, but pretty much tanked when more car companies started jumping into the minivan game with minivans that had actual minivan traits like sliding doors and long wheelbases. So how did Mazda respond? By adding another regular-car back door to the driver's side, and more SUV-aping body cladding, of course. So what do you call a vehicle with 3 rows of seating but less room than a minivan, a car platform, and SUV-aping styling and off-road pretense? That's right, a crossover.